Formed in Toronto, Ontario, Canada, the hard rock band Harem Scarem did well in their native homeland and also in Japan, but seemed to have somewhat missed the boat in the coveted US market, the curse of Warner Music. Throughout their career which began as early as 1987 they have unleashed twelve studio albums. (with the most popular probably being Mood Swings). 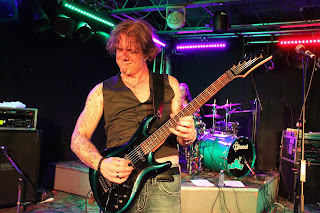 Founders Pete Lesperance and Harry Hess have remained in the band and the driving force throughout it’s tenure, undergoing a brief name change (they still went under Harem Scarem in Japan though) in the late 90’s/early 2000’s they finally went on hiatus in 2008 after an impressive 20 years. creating a local scene here. 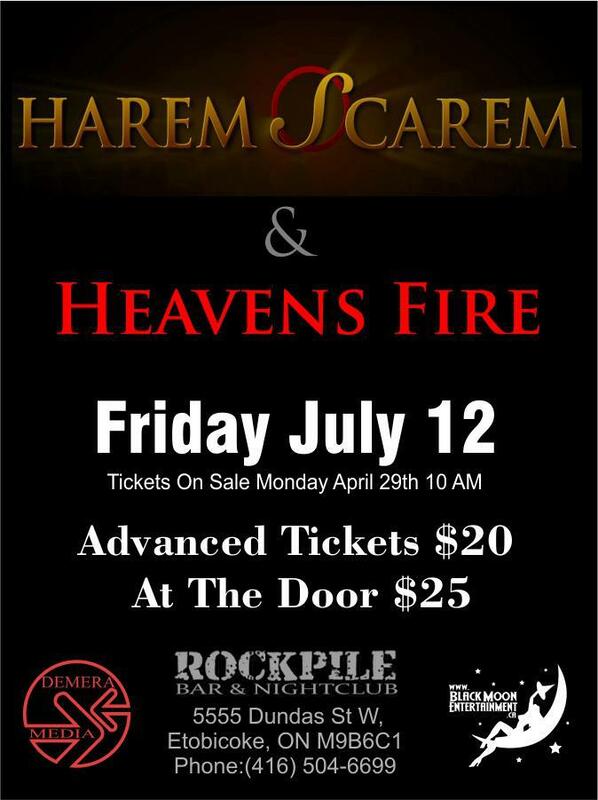 The Rockpile is becoming a destination, boasting such names as Faster Pussycat (many times), Helix, Kill Devil Hill, Drum Wars, Jack Russell's Great White, Stryper, Y&T, L.A. Guns, Dio Disciples, Brighton Rock and many more past and future. 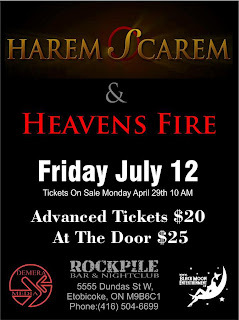 Together with Black Moon Entertainment they presented tonight's show with Harem Scarem, who took the Rockpile by storm, but not before some great stage setting opening acts. Duck Dynasty. As they started the actual set the riffage continued along with a heavy beat pulling you into their stage set. The bassist sported a real determined and angry look, a great rock bass-face while the guitarist, Barry Martin showed off the real rock and roll attitude, slinging his guitar around. 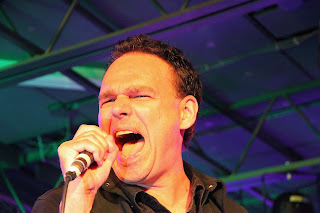 Singer, Chris Raposo's throaty, soulful growl fits well with the music and carried the songs through. As Duck Dynasty, even joking that they resembled a bunch of truckers, blasted through their set of heavy power rock that sounded a little like CCR mixed with Pantera with the raw, dirty riffs and the Southern swaggering bluesy feel they were on pace to finish early, so they added in a song even. This rough looking bunch of dirtbags is definitely worth checking out and here’s a link to their song Dyin’ Breed on you-tube. Check it out and let me know what you think of West Memphis Suicide. opposed by any means to soloing of any instrument, however I do not think that it has a place in a shortened opening set. It was very short however and then they were under way again with the ballad With You. Their final tune was a real treat for a die hard Iron Maiden fan like myself (if all goes well I will be seeing Iron Maiden in Brasil in September) when they ripped through a wicked cover of The Trooper. Definitely Warmachine is a high energy band and I've since visited their stuff via the Facebook page and it’s really good. Fellow Decibel Geek, Kate had purchased a CD at the show and now I'm wishing that I did as well. I was a little lacklustre this night and I think it has to do with the fact that I was hanging back at a table rather than rocking the front row as I usually do at a show….the only way to see a concert in my eyes (and ears)! and they were another high energy band of which I was loving the music and decided that I have to purchase merchandise after this one. They then proceeded to fulfill the curse with a guitar solo from founding member J.T. Harris. I could hear elements of Motley Crue in the mix as well along with the Iron Maiden feel and then they double cursed with a drum solo! They closed up with a great cover of the Van Halen classic Panama and Darren threw the microphone out in the crowd for an audience member to croon away for a chorus. The solos did not stop me from purchasing their Judgement Day CD, which is excellent and produced by Harry Hess as well, but I just wish that opening bands would drop the solos and fit in another song as that’s what wins over more fans in my opinion anyway. In any case check out the You-Tube link below for their song All For One, they are a great Canadian band. they left the stage at 1:30am. Only an hour? That seems to be way to short to me for a headlining act, but maybe Darren was tired as he’d been on stage for two bands (could have been three if he played with Warmachine) and really I guess with the late start time I don’t think I’d last until 3am or something. They returned for an encore of two songs comprised of Justice and Higher Ground to wrap it all up at 1:45am. Harem Scarem were amazing and super tight and clear just like playing the CD and they really seemed to be enjoying being up on stage now that they have re-formed, I just would have liked an earlier start and a longer set. 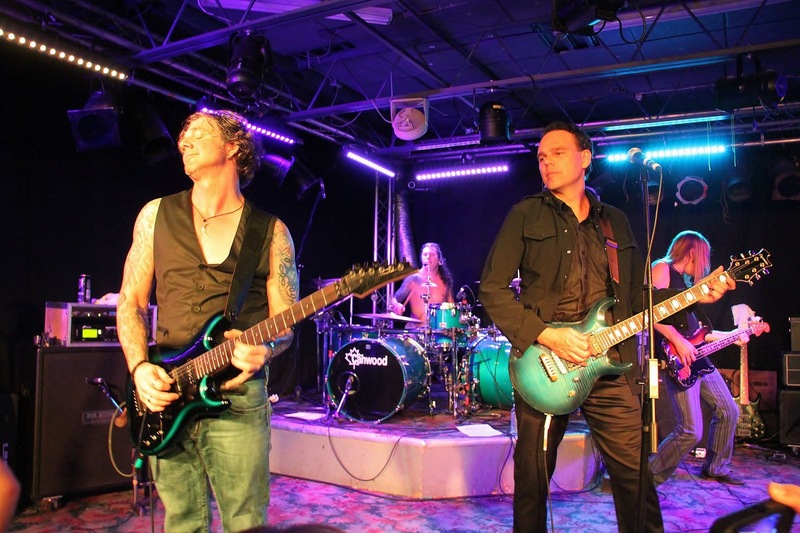 After some dates in Japan they are booked for a return headlining gig at England’s Firefest Festival in October which has also seen the likes of Brighton Rock, Coney Hatch and Honeymoon Suite. Darren sure is a busy guy with all his bands and I look forward to seeing him again on the Monsters of Rock Cruise as he sings with Jake E. Lee's Red Dragon Cartel. Let’s hope that Harem Scarem are also in the new music game as I’d love to hear some new stuff from the boys, but until then I guess it's Mood Swings on a constant repetition on my MP3 player! Great review of a great show. I love my Warmachine CD! !